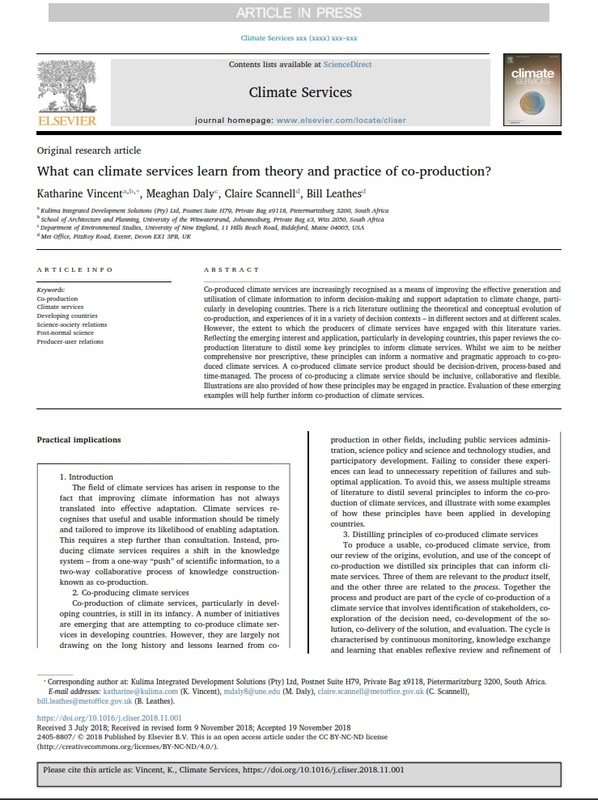 A new paper "What can climate services learn from theory and practice of co-production?" has just been made available online in the journal Climate Services. The paper, led by Kulima director Dr Katharine Vincent with co-authors Meaghan Daly, Claire Scannell and Bill Leathes, is an output of two projects funded by DFID: UMFULA (Future Climate for Africa) and Weather and Climate Information Services for Africa (WISER). Co-produced climate services are increasingly recognised as a means of improving the effective generation and utilisation of climate information to inform decision-making and support adaptation to climate change, particularly in developing countries. The paper reviews the co-production literature in other science policy fields to distil some key principles to inform climate services. A co-produced climate service product should be decision-driven, process-based and time-managed, whilst the process of co-producing a climate service should be inclusive, collaborative and flexible. Illustrations are also provided of how these principles may be engaged in practice.